← What Can You Do to Help Your Parent Do More For Themselves in the Living Room? Each year approximately 7 million people throughout the United States suffer from hospital delirium. This accounts for around 30 percent of those who enter the ICU. Though this condition can and does happen in all age groups, even children, it is particularly prevalent among older adults. Hospital-induced delirium is not just a condition that is frustrating and unpleasant when your senior parent is going through it but developing this condition actually more than doubles your parent’s risk of death during and immediately following hospitalization, and increases their chances of suffering from long-term cognitive effects by more than 30 percent. Fortunately there are ways that you can help to reduce the chances that your parent will develop this condition, starting with changes that you can make to their surroundings. • Add personal reminders. 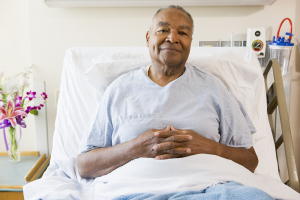 The stark, generic surroundings of a hospital room increase the chances that your parent will suffer from this condition. Adding personal touches to their room helps to “anchor” your parent in reality and keep their emotional health higher so it protects their mental health. Consider bringing pictures from home, their own blanket and pillow, and even a favorite knickknack or two to help them feel more comfortable and relaxed. • Request time-appropriate lighting. Disruption of the circadian rhythms can increase the chances that your parent is going to develop hospital delirium. The inconsistent lighting of a hospital is often to blame for this. Request that your parent’s room be kept with lighting that is appropriate for the time of day. For example, keep the room bright and cheerfully lit during the day, and then turn the lights off a night. Pull a curtain across the door, close blinds, and turn off reading lights over the bed to create as much darkness as possible. • Request that they are not disturbed at night. Talk to your parent’s medical team and ask that they avoid going into your parent’s room if at all possible during the night. This uninterrupted sleep is an important part of them avoiding delirium. Preventing hospital readmission is one of the most important things that you can do to protect your senior parent from suffering hospital delirium. Every time that your parent goes into the hospital there is a chance that they will experience this condition, and there are some indications that returning to the hospital soon after discharge actually increases the chances further. Hiring senior care for them is an effective step in helping them to stay safe and healthy so that they do not need to return to the hospital after discharge. The personalized care and support of an senior home care services provider also help your parent to avoid having to go into the hospital in the first place in many situations by reducing their fall risk, supporting better nutrition and more activity, and providing companionship and support that is highly effective in protecting mental and emotional health. For Senior Care Services in Memphis TN, please contact the caring staff at Personal Care Services MidSouth today! This entry was posted in Senior Care Memphis TN and tagged Senior Care Memphis TN. Bookmark the permalink.